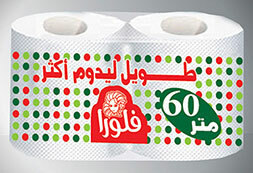 Flora - Pyramids Paper Mills S.A.E is a leading producer, converter, and exporter of tissue paper in North Africa, the Mediterranean, and many other countries in Europe. We are the leaders of tissue manufacturing in the Egyptian market and we have been distinguished as number one choice of the Egyptian families. Our quality products have always defined new standards for others to follow In Flora we care about our customers and distributors. Flora products are the number one choice of the Egyptian families. The market is attached to the quality bond we manage to create. At flora, we always respond to the market needs, catering for its needs. Our products exist in each home, schools, hospital and restaurant. Our pocket products are becoming a necessity to everyone. We understand your needs; we made the longest toilet in the market with 60 meter long White. Your feedback about our products and services is very valuable for us and allow us to improve our quality. Please follow the link to take the leave your feedback.